Black, white & rose : music for marimba with gongs, woodblocks and prerecorded tape / by Tristram Cary. 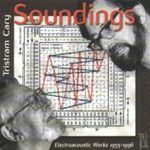 Percussion music #1 / Tristram Cary. Instrumentation: Marimba, woodblocks, gongs, beaters, pre-recorded tape. Commission note: Commissioned by Ryszard Pusz with funds provided by Australia Council. Performing Arts Board.